It is easy to look at the deficiencies of our current political climate and forget from whence we came. It is one of the reasons why many of those from “The Greatest Generation,” who saw friends give up their lives for the cause of freedom, quickly become frustrated with those who take those freedoms lightly, and neglect to see the progress this “experiment is self-government” has made in less than 250 years. 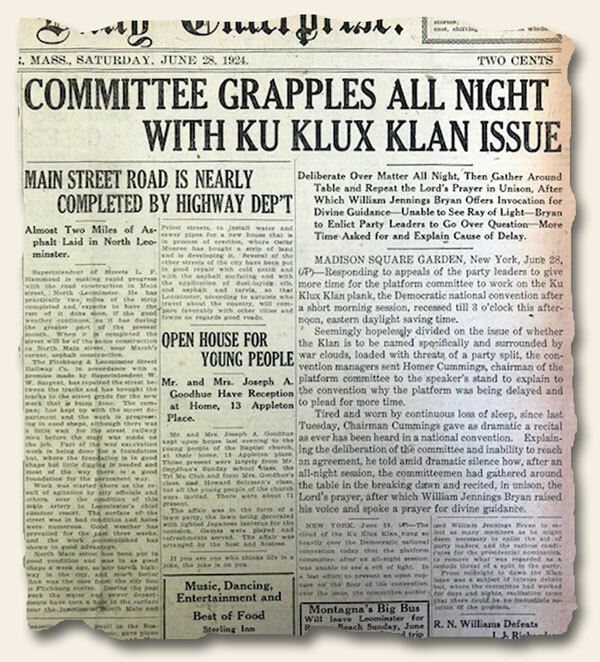 I was reminded of this truth when I came across a June 28, 1924 issue of the Leominster Daily Enterprise which had the heading: “COMMITTEE [DNC] GRAPPLES ALL NIGHT WITH KU KLUX KLAN ISSUE.” Let’s put down our partisan-tipped weapons, reopen the lines of communication, and with a degree of civility and mutual respect, move forward in our quest to make this country a place where each and every citizen can prosper on a foundation of equality, hard-work, and freedom.